Many women don’t think about the fact that the makeup and skin care products they use every day may contain harmful chemicals. The most common ones include formaldehyde releasers like quaternium 15, ureas, and DMDM hydantoin, all of which have been classified as “probable carcinogens” by the US Environmental Protection Agency. Parabens and phthalates, both of which are known to be endocrine disruptors, are also commonly used in cosmetics and other personal care products. Endocrine disruptors interfere with the functioning of the endocrine system, which regulates metabolism and helps maintain our brain and reproductive functions. There are still many debates over the risks of human exposure to the relatively small amount of these chemicals used in personal care products. The FDA, the cosmetics industry, and even the American Cancer Society continue to insist that parabens are safe, and there are no restrictions on the use of parabens in cosmetics in Canada. However, there are some exceptions to this general attitude among regulatory bodies in North America. Citing a review of methylparaben, proplyparaben, and butylparaben conducted back in 1984 by the U.S. Cosmetic Ingredient Review (CIR), an organization sponsored by the cosmetics industry, the FDA concluded that they are safe at a level up to 25% (currently, parabens are used at levels reaching up to 0.3% in cosmetics). By contrast, some European consumer safety agencies, such as the European Consumers' Organisation (BEUC), have raised the alarm bells on these kinds of conclusions, saying that the amount of human exposure to multiple parabens on a daily basis is much higher than most regulatory agencies have considered. What’s more, there is enough consensus on the harm that these chemicals pose to children that the US Congress has permanently banned the manufacture, sale or distribution of children’s toys and certain items (e.g. pacifiers, teething rings) that contain more than 0.1% DEHP, DBP, or BBP (all of these are types of phthalates). Some states have taken even more aggressive stances: California, Washington, and Vermont prohibit the sale of children’s products containing phthalates, and Hawaii, North Carolina, New York, and Mississippi having introduced legislation to prohibit the manufacture, sale, and distribution of products containing certain phthalates. The main problem with these chemicals is not a simple matter of whether coming into contact with them will harm you. The truth is, you may not experience any noticeable short-term or long-term effects from exposure to a single, or even a few potentially harmful chemicals, unless you suffer severe allergic reactions to particular chemicals, or are susceptible to other forms of chemical sensitivity, like MCS. The main problem with chemicals in cosmetics and other personal care products is that they contribute to the cocktail of toxic chemicals you are being exposed to continually, every day, on top of the chemicals you are exposed to in the air and your drinking water. Your body’s ability to excrete (flush out) some of these chemicals can’t possibly keep up. 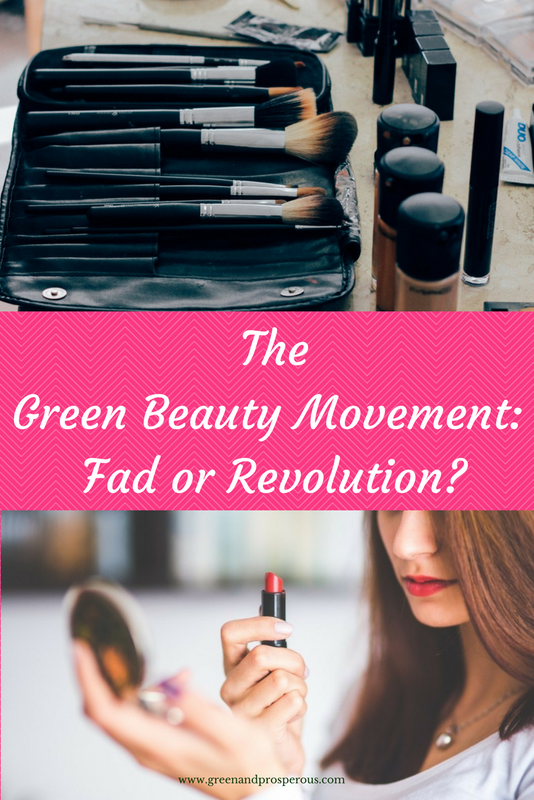 The key takeaways from the green beauty movement, in my opinion, are twofold: they help raise awareness about the need to be conscious of the ingredients that go into the products we use, and they illustrate the power of consumers to change manufacturing practices. That applies to green beauty products too, many of which contain packaging that is harmful to the environment. As consumers demand better and more eco-conscious manufacturing practices, producers will respond. How do green beauty products measure up to their (toxic) chemical-filled cousins? In the recent past, green beauty products didn’t offer as wide a range of options for skin, hair care, and makeup, and in most cases, they were not as effective as their counterparts containing harmful chemicals. With more companies responding to consumer demand, especially millennials -- who are more conscious than other generations about the importance of eco-friendly beauty --, there are many options for products that are effective and long-lasting. Companies like Origins, Aveda, Burt’s Bees, Dr. Bronner’s, Weleda, Melvita, Shea Moisture, and Alba Botanicals have been around for decades and have a proven track record, but there are others that are quickly becoming popular and in-demand. Some of the green beauty cosmetics companies whose stars are rapidly rising include RMS Beauty, whose philosophy includes a mission to go beyond merely manufacturing toxin-free, organic makeup to creating minimally-processed products that can heal and nourish the skin. Tata Harper provides an organic, cruelty-free skin-care line that they manufacture in their Vermont laboratory. Their blog promotes a healthy living and natural beauty lifestyle that is in sync with the demands of eco-conscious consumers who stress sustainability, accountability, and transparency for the products they purchase. Ilia Beauty was founded in Vancouver, Canada by Sasha Plavsic, whose brother (and now business partner) Zachary Ilia suffered from acute allergies and asthma as a child and was eventually cured using (a primarily organic) diet. Ilia adopts an “ethical-sustainable” approach to its makeup and skin care lines, which use high-quality organic and “bio-active” ingredients to deliver superior products. As with many eco-friendly trends, companies may engage in “greenwashing” in order to dupe unsuspecting consumers into thinking that they are being environmentally responsible by buying their products. When choosing beauty products that make claims about being eco-friendly, natural, or otherwise “green,” it’s important to always read the label of the product to make sure it doesn’t contain any potentially harmful chemicals or irritants. Does that mean you have to become a scientist to choose wisely? Fortunately, there are apps you can use to help you decipher the meaning of ingredients on the beauty products you buy. One good app is Think Dirty, founded by Lily Tse with a mission to educate consumers about the cosmetics industry by enabling them to make more informed choices about the products they buy. Another is Environmental Working Group’s Healthy Living app, which contains a large database of ratings of over 120,000 food and personal care products. While both of these apps are great resources for the motivated consumer (I use the Healthy Living app and love it! ), they can also be a little overwhelming and time-consuming to use. Want something simpler that is easily downloaded to your cell phone, tablet, or laptop, or that you can print, fold, and keep in your wallet? Sign up for our free resources library and get access to our toxic chemicals cheat sheet: once you’ve used it a few times, you’ll become familiar with the chemicals you should be wary of, and it will become second nature to recognize them on the labels you read. Aside from reading the label, it’s important to consider other aspects of a product that may signal that it (or the company that makes it) is not as green as you may be led to believe: does it come with excess packaging or packaging that is not eco-friendly? Where and how does the company source its raw materials? How does it dispose of its waste? If it works with indigenous or poor communities in other countries, does it engage in fair trade practices? Even the most reliable companies sometimes inadvertently make mistakes that can cause buyers to question their green credentials, but if they make sincere efforts to correct their mistakes and win back the trust of their customers, that sends a strong message about their commitment to the green principles they outwardly embrace. It also says a lot about the power of consumers to demand better, more sustainable and more eco-conscious business practices.